Friday evening. There is no flight scheduled for tomorrow and the kids are just headed off to bed. As Karen and I are sitting there at the kitchen table beginning to contemplate what our Saturday will look like, my phone begins to buzz. It's Oogi. There is only one reason that I can think of why she would be sending me a text message at this time of the night, and I tentatively reach across and pick up my phone. The message reads, "Nov 14 UB-BH-UB medevac. UB dep time 08:10, BH 10:35. We need 2 stretchers." My phone buzzes again a few seconds later. "7 pax with doctor from BH". Ok. I guess that my Saturday is now planned out for me. Translated into normal language, the text is telling me that we have a medevac flight tomorrow morning. 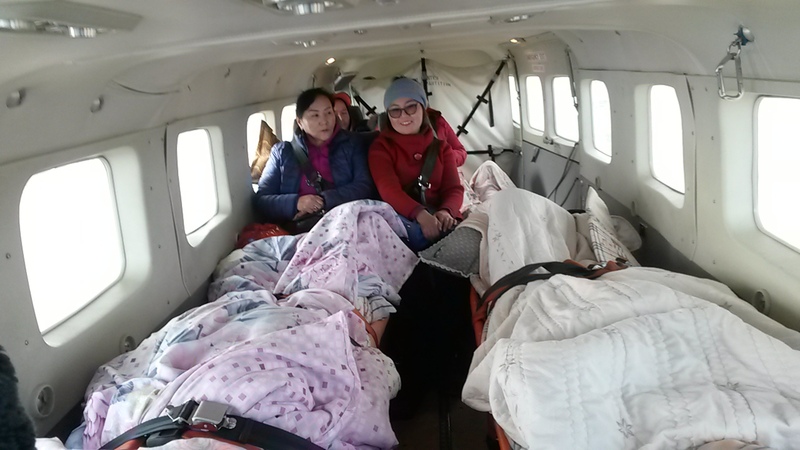 It will be leaving Ulaanbaatar at 8:10am for Bayankhongor, two hours flying to the west, to pick up 7 passengers which includes 2 passengers who require stretchers. Tentatively, we are planning to depart Bayankhongor at 10:35am to bring everybody back to Ulaanbaatar, where there will be an ambulance waiting for us to receive the patients. We will have a doctor flying with us to supervise the patients during the flight. I look over at Karen and shrug. "I guess that's that, then." My alarm goes off, the annoying, tinny sound of the beeping forcing its way into my consciousness. As wakefulness slowly makes its way into my brain I open my eyes, thinking as I do that it might be easier to do so with a pair of toothpicks to physiacally lift up my eyelids. Oohh. It's early. I force my body to begin moving and slowly climb out of bed and begin my morning routine. Waking up when the clock starts with a "5" is early, and I can't help but think of next summer when the daylight hours are so much longer and it's very possible that my wake-up time could begin with a "3". Ugh. Suddenly 5:30 feels a little bit like sleeping in. I try to be quiet as I get dressed and pull my things together into my flight bag. Most of it is already there, but there are usually a few things that I add on the morning of a flight. I have a quick glance out the kitchen window as I slip into my jacket, and I see that my ride to the airport is waiting below outside my door. I head out, closing the door behind me, engaging several locks before heading down the stairs and outside. We pull up to the hangar around 7:00 and head into the office. It is still dark out. I reach into my bag and pull out the packet of paperwork that is required for today's flight, setting them on the desk. Heading out through the door into the hangar, the coolness of the hangar hits me anew. I flip a couple light switches on to cast light on my plane, and head over to begin my pre-flight checks. 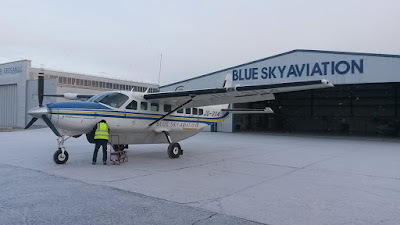 Cabin checks, paperwork in order, adequate fuel, good fuel, everything is mechanically sound and more. I turn and walk back into the office area and sit down to fill out the required paperwork for the day. As everything is now ready for the flight, I enjoy a few minutes of quiet solitude while waiting for my flight follower to return to the hangar with my radio operator. Radio work is carried out in Mongolian here, and we are required to fly with a second crew member who speaks Mongolian to operate the radio. My co-pilot is a former Mongolian air force pilot who spent his early days flying MIG's over Mongolia and various other parts of the world. He's in his 60's now and is a huge asset to me as I fly in Mongolia. I see our van approaching the hangar and head out to greet them. We attach the tow-bar to the nose-wheel of the aircraft as the three of us pull the plane out of the hangar and onto the ramp outside. In its current configuration my plane weighs about 3,300kg, but we are able to pull it out without too much effort. With everything in line and ready, we climb into the plane and radio the tower for permission to start up. In the last 5 minutes visibility has deteriorated significantly and I'm hoping that it is still good enough for us to depart. It isn't. We shut down the radios and climb back out to the ground. We'll be waiting for a while for the fog that is still rolling in to dissipate. Preparing to leave in light snow. Snow flakes begin to float through the air around us. Great. That won't help visibility either. Pulling out the tow-bar again, we push the plane back into the hangar to keep it out of the snow. Now we wait. As much as we can forecast weather and know all of the science behind it, there's still nothing that we can do to change it. That's one thing that the "Back to the Future" movie didn't get right. So we wait. As much as I'd like to indulge in another cup of coffee while we wait I decide not to. With a 2 hour flight in front of me it's better not to push the limits of my bladder too much and regret that coffee later on. Looking out the window, I watch as the control tower vanishes into the fog and visibility continues to diminish. Oh boy. Last time it was this bad I didn't get airborne until about noon. More waiting. At least the snow isn't bad. Although the ground has turned a magnificent shade of white, it's not falling fast and shouldn't pose any problem for us once airborne. More waiting. I walk over to the window and peer out again. Whoa! I can now just begin to make out the hills off the lower end of the runway. Those hills are close to 5km away, so we give the tower a phone call to see what the news is. It's good news, and we walk out to pull the aircraft back out of the hangar, climbing back in and this time receiving the clearance needed to start up the plane. It's been a relatively short delay and we will only be 30 minutes later than originally planned. With the pre-flight checks out of the way, I taxi through the lightly falling snow and up the taxiway to the threshold of the runway. We receive our take-off clearance and I advance the power lever forward to send us rolling down the runway and into the air. As we climb away from the runway and make a left hand turn onto our course, I can't help but think about how different this is than the flying that I was doing only a few months ago in Uganda. There wasn't any snow there! Cloud bank extending south. Below and to the north was "severe clear". 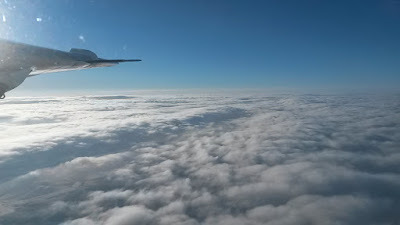 ourselves flying along the edge of a cloud bank. To my left is a solid layer of cloud extending southward and below me and to my right is "severe clear" and I can see all the way to the horizon. Continuing westward I am forced to climb as we approach the mountains that we have to cross over to get to Bayankhongor. Before coming here I had no idea how mountainous Mongolia was, and I am constantly amazed by the uniqueness of the terrain here. As we pass over the highest peak on our route, I bring back the power and lower the nose, allowing the plane to descend down the westward side of the mountains. As with most of the towns in Mongolia, there is a significant amount of smoke wafting out of the town due to the coal-burning power plant as well as the smoke from all of the other things that are burned in the Ger's to keep them warm. Today the smoke is wafting across my approach path and I have to focus on the runway a little more intently than usual as we approach and land. As we taxi onto the apron area and shut down I glance over and can see ambulances waiting outside the gate to drive out and bring me my patients. My co-pilot heads over into the control tower to get a new weather report and to file our return flight plan, and I move back into the passenger area of my plane. As much as is possible I try to keep the doors closed so that the heat will remain inside and the patients will be comfortable when they are loaded into the plane. I prepare our medical oxygen bottles and masks for the patients and make sure that everything is in order before opening the rear cargo door and motioning the first ambulance over to the airplane. We fly enough medical flights here that we have some nice equipment to help us out. We quickly transfer the patient from the ambulance stretcher onto my stretcher, and then load him onto the plane. The second ambulance backs up to my plane and we quickly transfer the lady onto my second stretcher and load her into the plane. To get the stretcher patients into the plane it is much easier to load them if I remove one of the seats, and as I turn to put the seat back in place for the flight home the doctor approaches me with a question. "What about other stretcher? Where it go?" Ummmm... the other stretcher? We were told that there were only 2 stretcher patients. I glance out the window and sure enough, there is a 3rd ambulance backing up to my plane. Interesting. It isn't difficult for us to configure the plane to accommodate 2 stretchers with a few seats available for medical staff or family members, but 3 stretchers is going to take a little creativity. As I sit there assessing the situation and my options I remember that we always carry a small collapsible stretcher in the cargo pod for any medevac that might pop up when I am already upcountry and don't have the other stretchers with me. I hop down and pull it out, unfolding it and laying it on the ground. Before loading the 3rd stretcher patient onto the plane we take the time to load one other patient onto one of the seats. If I have understood the situation correctly, these people were all involved in a car accident the previous day and the 3 who are on stretchers all have broken femurs (the large bone in your upper leg). The lady who is sitting in the seat has either a broken foot or broken ankle, but whatever it is it is clearly painful and it is very difficult for her to move. We are able to load the 3rd stretcher onto the plane much more easily than I had anticipated, and when everybody is aboard it is a little cozy, but everybody is safely secured in and they should all be as comfortable as their conditions allow them to be for the flight to UB. Everybody securely belted in and ready for flight. Patients heads are out of sight below the photo above. When flying medical flights, usually the challenge lies in getting the patients on board and as comfortable as possible for the flight, but there are still a few things that I can do once we are airborne. As I taxi out to the runway I try to keep the power application smooth and to keep my turns as smooth as possible, accelerating down the runway and lifting into the air as smoothly as possible. Once airborne, a gentle turn to the left as we climb puts us on course, and I'm thankful that the air is smooth as we slowly climb while we approach the western side of the mountains. As we fly back to Ulaanbaatar, we take a route that is slightly off of the direct route back so that we can avoid going any higher than necessary. My Caravan is not a pressurized airplane, and with medical patients on board we try to stay as low as safely possible so that our passengers will have as much oxygen as possible while they breathe. Thankfully, none of these passengers have any breathing issues, but I still try to keep them in oxygen rich air as we fly back. One of the patients does not feel well and takes advantage of the medical oxygen that we brought on board for them to use. After putting his oxygen mask on he quickly settles down and falls asleep. The air is very smooth and stable, and once again I am thankful that the patients are not being jostled around by unstable air during the flight. The flight home is very smooth, undramatic and mundane, exactly how I hope medevac flights will be. The smog of Ulaanbaatar has not yet made its way to the airport, and the clear air makes for an easy approach to landing. I mentally bear down for landing, and we touch down on the runway like a butterfly with sore feet. Inside I grin to myself. Although I'd like to say that I can land like that any time I want to, reality isn't always so kind and with a plane load of people with broken bones I am very happy that on this occasion I was able to land the plane without causing them any pain. We taxi slowly up to our parking stand at Chingiss Khan International Airport and come to a gradual stop. A few minutes pass as we wait for the ambulances to clear security and make their way out to the plane, and I keep the doors closed to keep as much heat in the plane as possible. 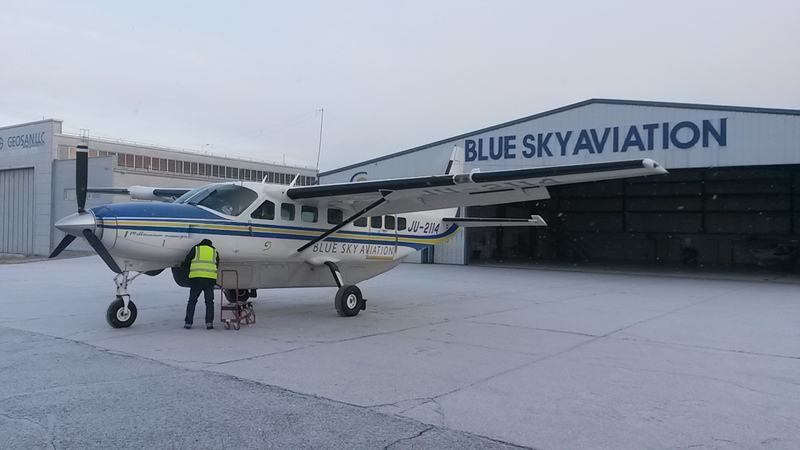 Several of our Blue Sky Aviation staff are also there to help out. The ambulances pull up to the plane and we slowly and carefully unload each of the passengers from the plane and into the ambulances. The ambulance doors close, and then slowly drive away from the plane to make their way to the hospital where the patients will receive treatment. Turning back to my airplane, I help our staff members to put all of our medical equipment back into the airplane and close all of the doors. Once the plane is fueled up for the next flight, I get taxi permission from the tower and make my way back up the taxiway to our hangar. We don't often hear about our passengers condition after they leave us at the airport, but that's just part of the job that we do. We do as much for them as we can while they are in our care. It's a blessing for us to be able to be a help and encouragement to them during their time of trouble. We push the airplane back into the hangar where it will wait patiently for the next phone call that will bring me back out to the hangar to get it ready to go and bring hope and help to whoever needs our services. As for me, I finish up with my post flight paperwork and get all of my things together and back into my flight bag, ready for the next flight. We make our way back into the city and as I turn the keys of my doorway I smile as I hear the excitement on the other side of the door as my family realizes that I am home from my flight. It's not a life that I would ever have imagined for myself or my family, but it is extremely rewarding. Although we are not rich, we live rich lives as we serve God. We look forward with anticipation to what will come next in our journey as we follow God's leading in our lives.